To the ITF Gold-Badged Judge, Mr. Carlos Ramos, of Lisbon, Portugal, this letter is aimed at you, but the same sentiment is to be shared with any and all Officials of professional sporting events. When your “subjective” ruling(s) have an impact on the outcome of a sporting event, you have STOLEN the moment from the competitors, the thousands of fans in attendance (many of which have paid dear sums of money to be there) as well as the millions of fans watching on Cable TV and internet streams. Personally, I had invested the two full weeks watching a large portion of the matches that were broadcast, especially the ones on the three show courts, which meant I had watched all of Serena Williams’ matches fully, which were played on Ashe Stadium as well as all but the 2nd Round match of Naomi, which was played on court 17 (for some reason, ESPN incorrectly doesn’t recognize Court 17, as a show court and therefore charges extra to view). In all, I’m guessing I watched some 70 Women’s singles matches over the fortnight. All of those hours spent watching the earlier rounds were preparing me for the pinnacle match, the Final. I’m hoping this analogy isn’t too graphic, but the early rounds are like foreplay and the Final Round is like, well … The Final – The Big Event – The Climax. I’m not suggesting a different winner would have evolved if the match had concluded with some form of normalcy, but Serena’s comeback record against top competitors even after being down two breaks in the final set is a statistical fact. But thanks to you Mr. Ramos, we weren’t afforded the opportunity to witness another historic comeback. The possibility was stolen. By definition, when you steal something, you’re considered a thief. From a fan’s perspective and I’m guessing players as well, the main job of a Tennis Umpire is overseeing the 7 or 8 line judges as well as the ball kids, and keep track of and announce the score. So you have to be more than understanding when a Williams is suspect of an Umpire when their Tennis history includes an Umpire not even keeping track of the score as happened to Venus on Centre Court during a second straight tie-break at Wimbledon back in 2004. Ted Watts, who was the Umpire of that infamous match was subsequently demoted (silver to bronze badge). Furthermore, if you think Serena does not remember ALL the slights and wrongs that have happened to either herself or her sister, you’d be wrong. If you’ve ever watched a match with Serena closely, you’d notice that 99% of the time she walks on the far side when players change sides between the 1st and second games of a set. In fact, I noticed she even did this when playing against her sister Venus during their third round match at this year’s US Open. Why does Serena do this you may ask? Well it stems from a bumping incident that involved her Sister Venus and the fiery Romanian player, Irina Spirlea that happened in the 1997 semifinals at the US Open. By walking on the far side, Serena never puts herself in the situation where such a bump can happen during this particular changeover moment. Ironically, Serena played Spirlea the following year at the US Open and lost in three sets. For some strange reason, even though this was the most egregious of Umpire fumbles during this year’s US Open, it was not the only one. In a completely sexist incident, Chair Umpire Christian Rask had earlier admonished female player Alize Cornet for changing her shirt on court. Men do this all the time and the WTA actually does not have a rule regarding this. “We have clarified the policy to ensure this will not happen moving forward. 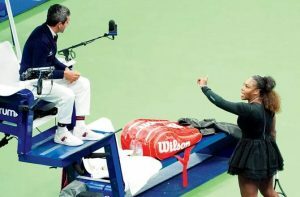 Fortunately, she was only assessed a warning with no further penalty or fine,” read a statement from the USTA, which runs the U.S. Open. The oddest Umpire moment may have happened in the 2nd round of the men’s draw when the Chair Umpire, Mohamed Lahyani, hopped down from his perch and offered Nick Kyrgios what appeared to be a pep talk, imploring him to give more of an honest effort. Coaching is prohibited during matches at the Open — except, apparently, when chair umpires are doing it. Likewise, no one tuning in to watch is doing so because of, or to watch the Umpire. No one really cares. No one has paid the exorbitant prices to attend is doing so because of, or to watch the Umpire. No one cares in the least. What we do care about is for an Umpire to understand part of their job MAY include being belittled by a competitor. It’s unfortunate, but it’s also true. We as people coddle and allow (and often times expect or even want) our top athletes and other performers to melt down publicly. Consider it part of the performance we’ve come to witness. We yearn for the spectacle of it all. The display of such raw emotions is indeed noteworthy. What we don’t want though, is for a fragile Umpire to overtly influence the outcome because he was offended slightly. Carlos Ramos did just that on Saturday. He quite literally stole the moment away from all of us. I suspect he will be subsequently demoted and as Serena mentioned, never chair another of her matches again. If you don’t understand the totality and gravity of doing what was done during this match, you’re not qualified to be chairing events at this level. As a final thought, I’m fairly certain, the book makers and wagerers in Las Vegas and elsewhere are more than upset with this state of affairs, since the betting line for Naomi winning had a significantly higher payout than if Serena had one, and since there was outside interference, they may have some clause to try and wiggle out of making any payments. A debacle potentially valued at millions of dollars created by Carlos Ramos’ sensitivity to being called a thief. Grow a pair Mr. Ramos. Copyright © 2019 Darryl Glover's Opinion. Powered by WordPress. Theme: Esteem by ThemeGrill.